each client’s needs. In a large chandelier consisting of several smaller lamps one will not find two identical ones, just like there are no two identical leaves on a tree. The modern design of our lamps, characterized by simplicity of form and use of the newest technologies remains in perfect harmony with traditionally blown glass. As a result Velt lamps are universal and fit both classical and modern interiors. We also design and build big light installations for public areas such as hotel lobbies, office and residential buildings as well as shopping centers. Jeremi Nagrabecki was born in Warsaw in 1977. He designs modern lamps for indoor use. He strives for each of his lamps to embody an idea that has never been seen before. Most often, these are technological solutions that allow the user to focus or direct the light, or ways to conceal the light source to make it easier on the eyes while also capitalizing on the beauty of hand crafted glass – the designer’s material of choice. How did Plan 9 lamp come into existence? The light, penetrating hand-blown glass, produces streaks of colour, reveals minor differences in thickness, sometimes shows submerged air bubbles. These features make each lamp unique. 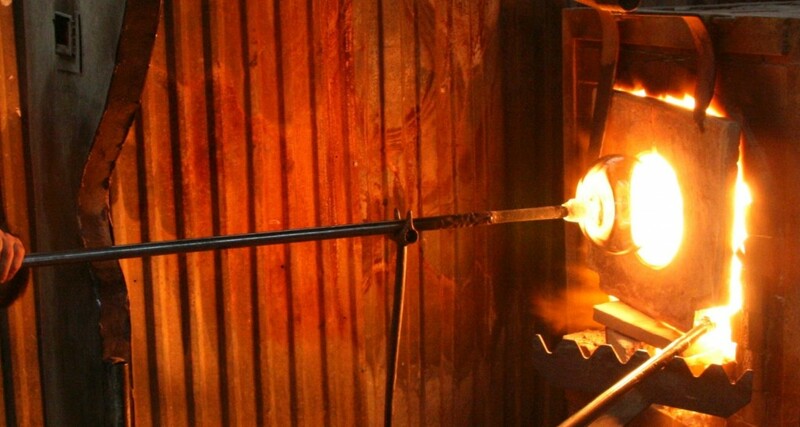 At first, a small bubble of molten glass is carefully and deftly blown through a long steel blowpipe in such a way as to provide it with definite features – the origin of its future shape. 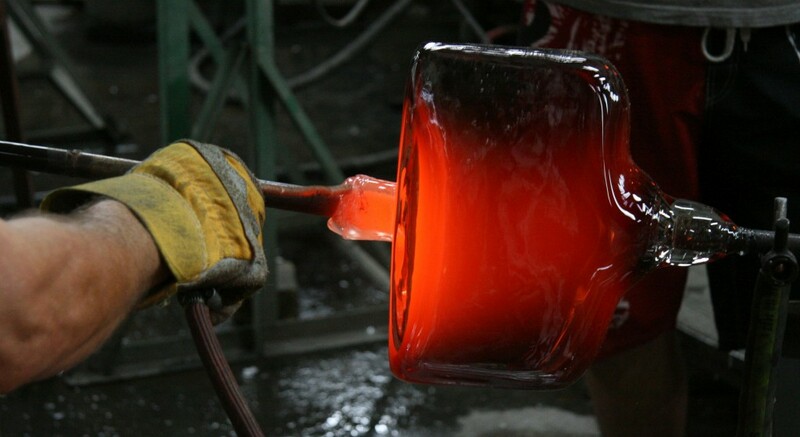 When the bubble cools down it hardens which makes it possible to cover it with a proper amount of molten glass from the furnace with a movement similar to that of reaching for liquid honey by turning a teaspoon. We roll the glass by supporting it with a wooden shaping block while blowing and manipulating it in order to obtain the desired thickness, shape and distribution of glass in the expanding bubble which has now acquired the shape of a large pear. The center is now almost ready. In order to finish the edge and spread out the pear into a flat plate it is necessary to get rid of the blowpipe. We attach another pipe by gluing it to the hot glass at the bottom, remove the now useless blowpipe and take the bubble (always rotating) to a small intensely flaming furnace. The glass whitens and softens so it is now possible to shear off the edge. 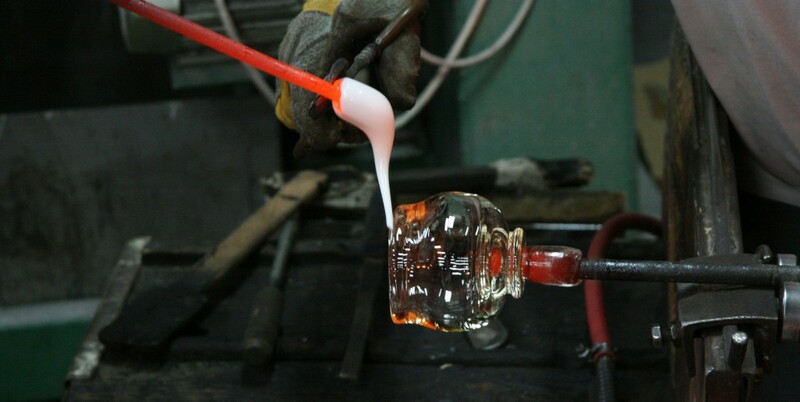 We the turn up the heat and cover the edge with a layer of semi-liquid hot colored glass. Then another increase in temperature to the level of softness. Using a wet (to avoid catching fire) piece of wood we spread out and broaden the glass – the pear turns into a bowl. At a certain precisely determined moment we begin to rapidly spin the pipe attached to the bowl, increasing the speed until the bowl, due to centrifugal force, opens up into large flat plate and the overlay on the edge stretches out to form a delicate colored rim. Now comes the time to rip off the pipe (hence the term “ripped glass”) and deliver the ready glass on a fork to the drawing die. After several hours of proceeeding through gradually decreasing heat the lamp plate comes out of the annealing oven. On the bottom, like a mark of the umbilical cord, remains a scar after the second pipe testifying to the renowned, ages-old method of production.